Versatile asparagus is a nutritional powerhouse that pairs well with fish, beef, shrimp, veal, chicken, and pasta, but is also great on its own as a side dish. Rich in antioxidants, fiber, and vitamins, asparagus is as nutritious as it is delicious. One of the first vegetables to arrive in spring, this beautiful perennial looks like a soft fern in the landscape. Asparagus is one of the few perennial vegetables we can grow in North Carolina. Once established, an asparagus bed can produce for many years. 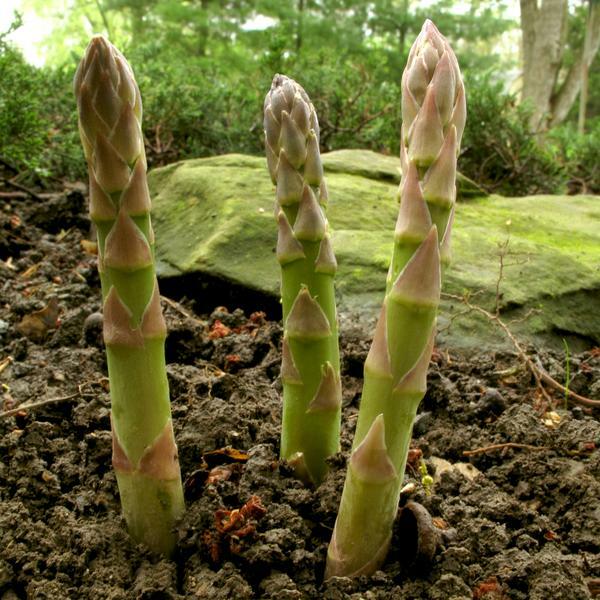 Plant asparagus in winter, between mid-January and mid-March, while the plants are dormant. Plants will be most productive when grown in full sun. For best results, plant asparagus in deep soils that have been well amended with compost. Good drainage is essential, so raised beds are an excellent strategy for asparagus plantings. Test the soil and amend according to the recommendations at least seven days before planting. Acidic soils will require lime applications to raise the pH to 6.0 to 7.0. Plant all male crowns, one to two years old. Use the trench method, digging 6 to 7 inches deep and 12 to 18 inches wide. Set crowns 5 to 8 inches apart and cover with 2 inches of soil. As the plants grow, continue to cover with 2 inches of soil as needed until crowns are 8 inches deep. If planted in rows, space rows at least 5 feet apart to reduce disease and increase yield. Keep plantings well watered during the first year. Do not harvest spears the first year to allow plants to establish strong root systems. Begin lightly harvesting the second year, and work up to a six- to eight-week harvest by the fourth year. Jersey varieties grow well in North Carolina: Jersey Giant, Jersey Knight, and Jersey Gem. For additional recommendations visit Cornell University's Vegetable Varieties for Gardeners. Choose odorless asparagus stalks with dry, tight tips. Avoid limp or wilted stalks. Select a bunch with spears of uniform thickness so they all cook in the same amount of time. While larger, thicker stalks are good for grilling, steaming, and roasting, the smaller, thinner stalks are better in some recipes. Refrigerate asparagus for up to four days by wrapping the ends of the stalks in wet paper towels and placing them in a plastic bag. Information in this section was adapted from Fruits & Veggies—More Matters®. Cut off the white end (the base) of the stalk before cooking or eating. Slice fresh, raw asparagus and add to salads, soups, and stews. Brush with olive oil, sprinkle lightly with salt and pepper, and cook on a grill or under a broiler for a delicious, low-fat treat. Slice asparagus into 1-inch diagonal slices. Heat oil in a 10-inch non-stick skillet and sauté asparagus and scallions for 5 minutes. Blend egg substitute, cheese, and mint. Pour over asparagus and scallions in skillet and cook on medium heat, gently pulling sides from skillet to cook eggs throughout. Cover skillet with lid once egg mixture is cooked halfway through. Use a spatula to divide it into thirds. Turn each piece once. Serve immediately. Coat a clean grill rack with nonstick cooking spray. Preheat grill to medium (300°F to 350°F). Trim and discard tough ends of asparagus. Combine asparagus, olive oil, red pepper flakes, vinegar, sugar, and salt and pepper to taste in a large shallow dish. Marinate 15 minutes. Grill 5 to 6 minutes, turning once. Arrange grilled asparagus on a platter and sprinkle with toasted sesame seeds. Preheat grill to medium (300°F to 350°F). Thread asparagus onto two or three parallel skewers to hold them together during grilling. Thread tomatoes onto two skewers. Brush vegetables with 1 Tbsp. oil and season with salt and pepper to taste. Place skewers on grill. Grill for 5 minutes, turning occasionally. Remove the skewers from the grill, and remove the vegetables from the skewers. Cut asparagus into 2-inch pieces. In a medium bowl toss asparagus, tomatoes, blue cheese, onion, and garlic. Drizzle with remaining 1 Tbsp. oil and vinegar; toss. Season with salt and pepper to taste; sprinkle with basil and serve. Steam or microwave asparagus until tender crisp. Drain. Combine cooked pasta and asparagus in a large bowl. Stir in chicken, tomatoes, onion, and olives. Gently toss with pesto sauce. Recipes in this section were adapted from information found at Fruits & Veggies—More Matters®. Cool and Crisp. If you are using asparagus in salads or for other cold dishes, boil or steam it until it’s done, then plunge the cooked asparagus into cold or iced water immediately to stop the cooking process and help preserve the color and crispness of the vegetable. Veggie Fettuccine. Toss asparagus with red and yellow peppers for a colorful dish. Finger Food. Asparagus makes a great appetizer for tailgating. Creamy Soup. Use leeks, onions, russet potatoes, asparagus, low-sodium chicken broth, lemon juice, and low-fat sour cream to make a lower-sodium soup. Raw. Rinse and dry asparagus and enjoy it as is or in your favorite dip. Shake and Bake. Place fresh asparagus in a plastic zip lock bag, drizzle with olive oil, add salt, pepper, and other seasonings. Shake until asparagus is coated, then bake at 400°F until crisp. Steamed. A great snack or side dish, cook fresh or frozen asparagus, garlic, and low-sodium seasoning over a small amount of boiling water for 3 to 8 minutes depending on the thickness of the spears. You can also use a microwave. Gourmet. 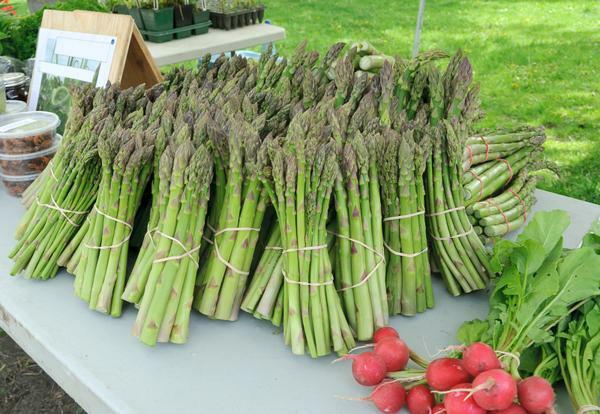 Dress up your traditional steamed or boiled asparagus with a mustard vinaigrette dressing. Cheese, Crackers, and Asparagus. Spread a soft cheese (for instance, goat cheese or brie) on whole wheat crackers and top with a crisp asparagus tip. Serve as an appetizer or an afternoon snack. Grilled. 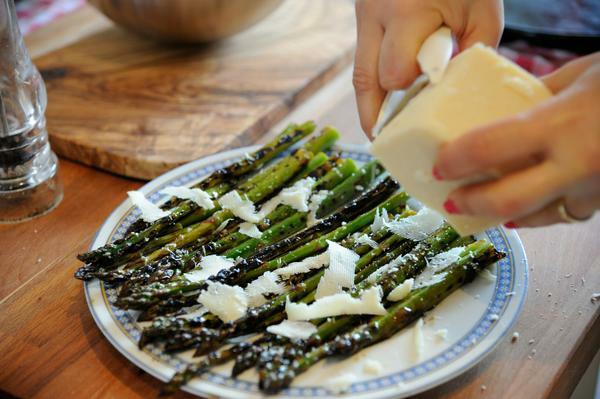 Place asparagus spears on a grill coated with olive oil spray and preheated to medium-high heat. Cook for 5 to 8 minutes until tender, turning occasionally. This section adapted from information found at Fruits & Veggies—More Matters®. Courtesy of Fruits & Veggies—More Matters®. NC Cooperative Extension Gardening portal. The authors wish to express appreciation to Chris Gunter, Rachel Herring, Debra Ireland, Issac Lewis, Chantel Lumpkin, and Karen Neill for their assistance in preparing this publication. Saunders, Douglas C. 2001. Home Garden Asparagus Production. Horticulture Information Leaflet 8002. Raleigh, NC: NC State Extension. Fruits & Veggies—More Matters®. Accessed May 2015.